It is obvious that the development of modern bridge simulators provides an advanced tool for maritime training. Apart from the educational function, advanced simulators can, with the proper knowledge and tools, be deployed for the feasibility study of ship manoeuvring for existing ports, ships in operation as well as ships, ports and locks in the design phase. For these purposes it is absolutely necessary to set up proper ship mathematical models and establish a scientific process for assessment of ship real time manoeuvring in suitable simulators. Sen Thanh Do, mathematical engineer at Simwave, presented this study at the 19th Annual General Assembly of IAMU 2018 in Barcelona, Spain this fall. 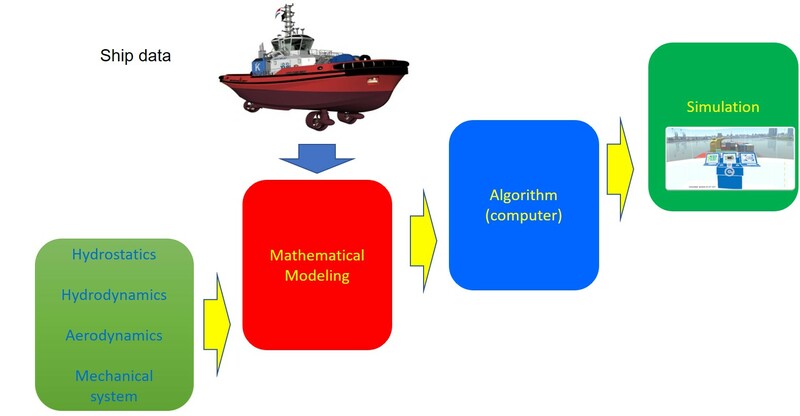 The mathematical model of ship motions is considered as an artificial brain deciding the processing capability of a bridge simulation system and ensuring the reality of ship manoeuvring. It can be described as a set of differential equations based on Newton’s equation (Sir Isaac Newton’s equations of motion). The idea is how to use a suitable mathematical model to simulate the ship motion in six degrees of freedom and in real-time mode with satisfying behaviour for the feasibility study of ship manoeuvrability. At Simwave, the mathematical modellers apply fundamental and deep knowledge including hydrostatics, hydrodynamics, aerodynamics, mechanical system to develop the mathematical ship model based on Kongsberg’s hydrodynamic mathematical tools. For a detailed description of the methods and theory we can refer to the paper. -Feasibility study on manoeuvring of a vessel. -Feasibility study on the design of ports/jetties. -Feasibility study on the design of fairways. 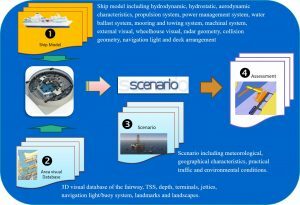 The method of application for modelling and simulator assessment can be described with figure 1 (below), in 4 steps, including Ship model development, Area visual database development, Scenario development and Assessment. 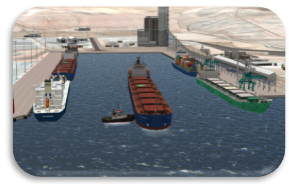 With the above-described method, Simwave has already in 2018 conducted successfully some projects such as “Real-time simulations regarding safe berthing and unberthing of a completely newly designed bulk carrier sailing from and to the New Port of Conakry in Guinea, Africa” and “Real-time Simulations Regarding Safe Manoeuvring and Towing of Ships in Aqaba New Port, Jordan”. With the application of mathematical modelling, the assessment of ship manoeuvrability, the feasibility studies on ports and fairways, can be performed with the right modelling in a high-end bridge simulator. Simwave’s modelling based on the Kongsberg platform can provide advanced technique to assess the ship manoeuvrability for all ships, ports and fairways.